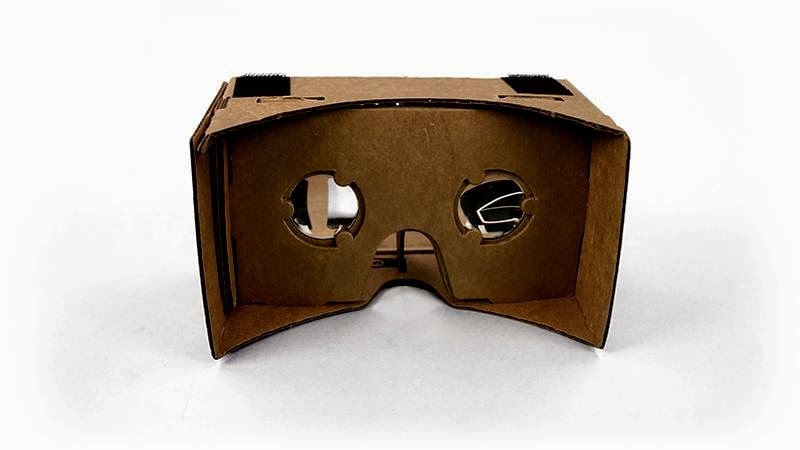 I just got my Google Cardboard https://developers.google.com/cardboard/ kit from Chinavasion https://www.chinavasion.com/china/wholesale/Home_Audio_Video/Video_Glasses/DIY_3D_Google_Cardboard_Glasses_-_Mobile_Phone_Virtual_Reality_3D_Glasses_NFC_Iphone_Android/ – not only is the kit complete with all lenses, magnet and washer, NFC Tag, Velcros, etc, but it came fully pre-assembled with the lenses and other doo-dads already installed – you just need to fold it up and drop the phone in. 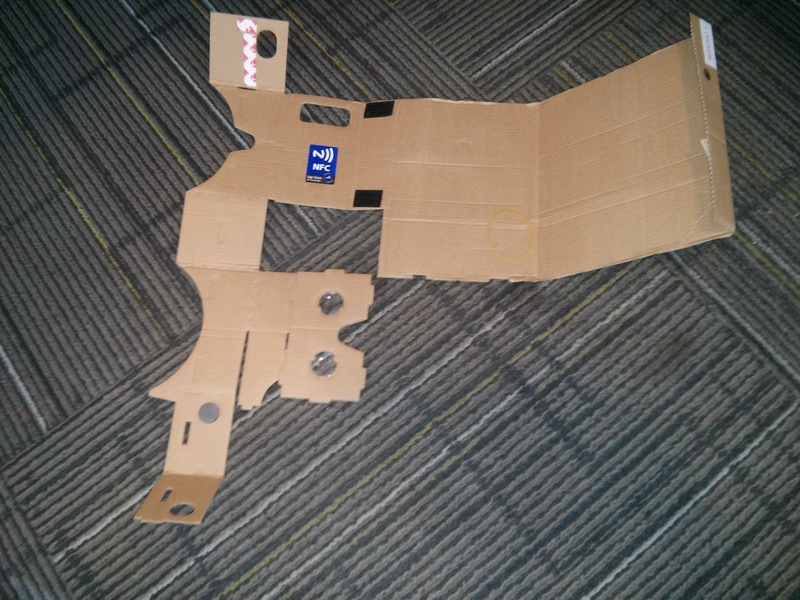 The NFC tag appears to be un-programmed, but that's easily fixed with a free NFC-Writer app such as "NFC Writer by Tagstand" https://play.google.com/store/apps/details?id=com.tagstand.writer&hl=en-GB - just program the NFC Tag to launch "cardboard://v1.0.0" (without the quotes) and it should launch Cardboard app. 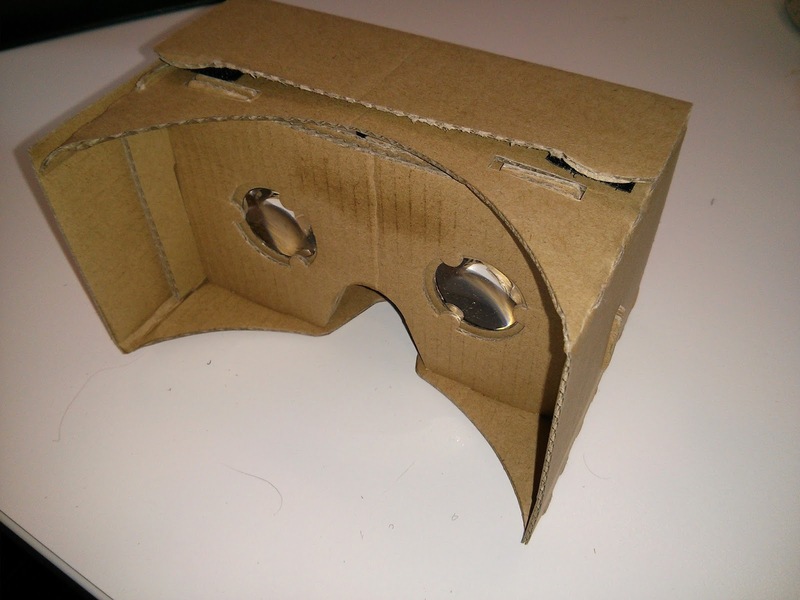 The lenses are fine, and it works a treat with my Nexus 4! I've been using a cheap no-brand pair of 10x50 binoculars for some time - both for general daytime terrestrial viewing, and especially for night-time star-gazing use. They're OK (well, actually, they're pretty rubbish! ), but I really wanted an affordable pair of reasonable quality 10x50 binoculars. Warning: Don't confuse the Pentax XCF binoculars with the very common "Pentax Whitetails Unlimited" binoculars that you'll find all over the internet - reviews of the Whitetails suggest that while they may be made in Pentax factories, the Pentax name appears nowhere on the binoculars or packaging, so while they may well be perfectly acceptable for the price, presumably the quality is not in the same league as the branded Pentax XCFs. The XCFs only cost about 30% more than no-brand 10x50s, but the build-quality and optical quality compared to my previous pair is chalk and cheese! The XCFs are so much brighter and sharper, and also have a much wider field of view (6.5 degrees actual / 65 degrees apparent eyepiece field of view compared to about 4.5 degrees actual / 45 degrees apparent for my old pair). The old binoculars feel like I am looking though a cardboard tube in comparison. The coatings, lenses and prisms are clearly (pun intended!) far superior to my old binoculars, and it shows in the image quality. Everything is pin-sharp, right across the field of view, and the difference for star-gazing in particular is almost startling - they reveal a significantly wider expanse of night sky, and show much fainter stars and nebulae against the background. They are nicely weighted and balanced, and feel very good in the hand. I would definitely buy the XCFs again, and I am happy to recommend them to others looking for good quality budget-priced binoculars - they are a great value buy! The PENTAX XCF series combines outstanding optical performance with exceptional value. 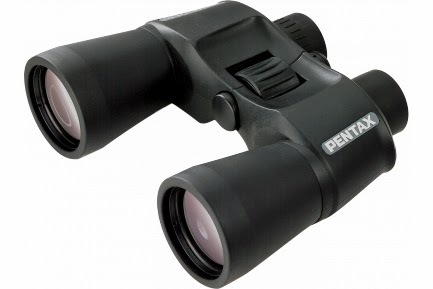 Ruggedly styled and providing excellent viewing comfort, the PENTAX XCF series binoculars are as easy to operate as they are to afford. High-quality BaK4 prisms and multi-coated optical elements ensure excellent image quality and light transmission. Soft but durable rubber eyepiece rings can be folded back for the convenience of eyeglass wearers. And a centrally-located, extra large focus wheel affords fast and accurate focusing. Sporting fashionable, black-finish bodies encased in full-body rubber housing, the PENTAX XCF series is ideal for almost any application from casual viewing to serious observation. Available in four different magnifications. I have two telescope mounts - a Celestron SLT Go-To Alt-Az, and a powered EQ2 basic German Equatorial Mount (GEM), which has no computer control capability. However, I have added Push-To capability to my EQ2 using my Android Smartphone, an app called SkEye https://play.google.com/store/apps/details?id=com.lavadip.skeye , and a means of attaching my phone to my telescope. You are probably familiar with the "planetarium" apps which use your phone's sensors to show the night sky in which ever direction you are facing and pointing your phone. SkEye works like this, except it allows you to use what it calls "Indirect Mode", in which you attach your phone or tablet to the telescope, point the telescope at a target, and then tell the app what you are targeting, so it can build an angular offset into its sky view. The app then uses your device's sensors (compass, accelerometers and gyroscopes) to recognise all movements of the device, and thus the telescope that it is attached to. What is very clever is that the app allows you to perform multiple alignments, and to re-align as the evening's viewing proceeds. The first alignment will work very well for targets within a few degrees, but when you slew right round the sky, chances are that you could be a few degrees off when you re-point the telescope. This is easily fixed - simply target and align a prominent star or planet in the general vicinity of the target you are seeking, align it (which adds it to your list of alignments, rather than erasing any previous alignments), and you should then have surprisingly accurate alignment and "Push-To" functionality in that region of the sky. In this way, the app then only needs to keep track of small phone / telescope movements over a small area of sky, rather than having to rely on a fully-aligned sky hemisphere. If the app's precision starts to "drift", just do another local alignment, and you're good to go again. The app developers point out that the phone should be mounted well away from any magnetic materials, to ensure the compass works properly. My OTA is aluminium, so that's not a problem, but the phone holder is mostly plastic, but with a bit of wire in the phone bracket. The compass can detect this when it is very close, but a bit of trial and error revealed that my phone's compass sensor is mounted near the top of the phone, and the app works well if I mount the phone in "landscape" orientation, offset to keep the top of the phone as far as possible from the mounting bracket, as shown in these photos. You might need a bit of experimentation to find an arrangement that works with your phone and telescope. Other options for securing your phone / tablet could involve permanently fixing a cheap case to your telescope, using rubber bands or Velcro, etc. 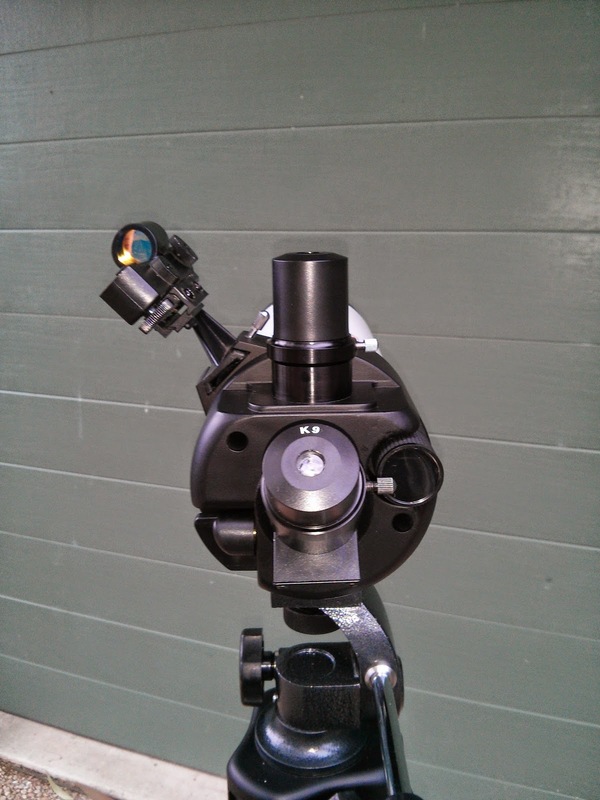 Add this to my simple way to achieve a good polar alignment on an equatorial mount http://julianh72.blogspot.com.au/2014/08/handy-tool-for-polar-aligning-your.html and you have a very capable Push-To telescope mount, at next to no cost! I bought myself a MicroView recently - it's a chip-sized Arduino with built-in OLED Display! Awesome! Now I've just got to work out what I'm going to do with it! Pretty well all modern smartphones have a compass and inclinometer built-in - all you need is a suitable app to access the data. I use the "Smart Tools" app on an Android phone, but there are numerous similar apps on most smartphone platforms. Set up the tripod at the desired location. If your tripod doesn't have a spirit level bubble built in, lay your smartphone on the tripod platen, screen facing up, and use the spirit level app to get the platen as horizontal as practical. Now install the GEM mount and counterweight, and put the scope on the GEM. Use the altitude dial scale to set the altitude of the GEM RA axis to approximately match your latitude, and point the GEM approximately south. Align the telescope tube to be parallel to the GEM RA axis, so that it is pointing approximately at the south celestial pole (where the GEM is pointing). First, I get the altitude of the GEM set more accurately to my latitude using the spirit level / inclinometer app. The app reads to an accuracy of 0.1 degrees, so you should be able to get better than one degree precision pretty easily. Voila! A visual polar alignment within about 1 degree or better on both axes in a matter of a minute or so. In an effort to expand the scope of this blog, but to help people (including me!) find things that they might be interested in, I have created some "Labels" which I will use to tag all posts. You can filter for the "Label" you are interested in by selecting it from the menu on the right-hand side of this page. Stay tuned - who knows what other areas I will choose to add here?! I'll try to make sure all posts are tagged with an appropriate "Label" heading, to try to keep things organised somehow. Stay tuned - who knows what sort of stuff will find its way on here?! I thought I’d post a quick review of a cheap 90mm Mak that I just picked up on eBay for US$149.99 (plus US$80.58 USPS priority international shipping to Australia). I already had a 90mm short-tube refractor, which I bought as a basic “grab and go” travel telescope, but I found the limited focal length a restriction for lunar / planetary viewing, and the CA on bright targets is a bit of an issue (tolerable, but very noticeable). I recently developed a hankering for an even more compact Mak to replace it, and started browsing eBay etc to see what I could find. 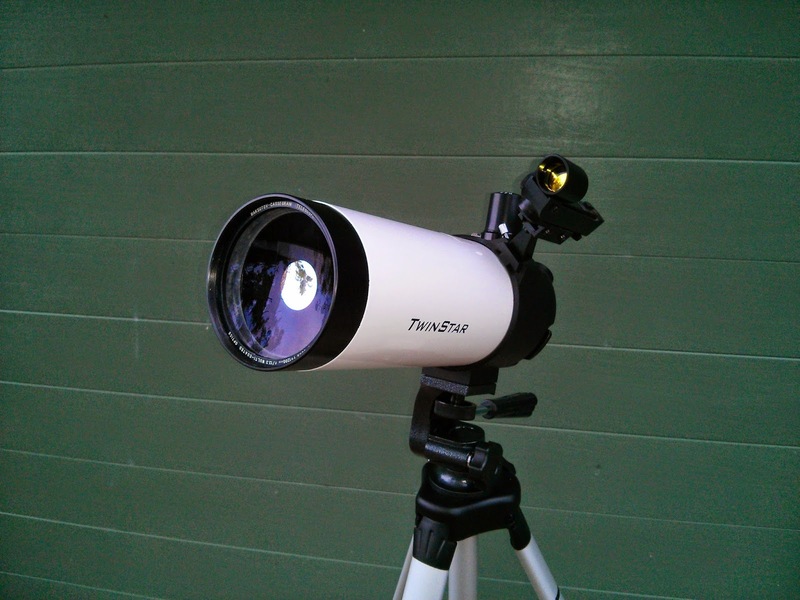 What I came up with is a "TwinStar" 90mm Maksutov, with a 1200mm focal length (f/13.3). It came with a very basic Alt-Az tripod, an 8x21 finder scope, a 45° “erect image” prism (intended mainly for terrestrial viewing), and two 1.25” eyepieces (Kellner 20mm and Kellner 9mm, both with storage containers). The telescope is made in China, supposedly “manufactured in the very same factory that makes optical products for Bushnell, Tasco, Konus and many other name brands” - whatever that means! One thing that appealed to me is that the telescope back has two optical ports - a straight-through threaded port (which the supplied 45° prism screws onto - or you can screw on an extension tube adapter for photographic use, or just leave it blocked off with the supplied screw-on dust cap), and a 90° port which is intended to be the primary astronomical visual eyepiece port. 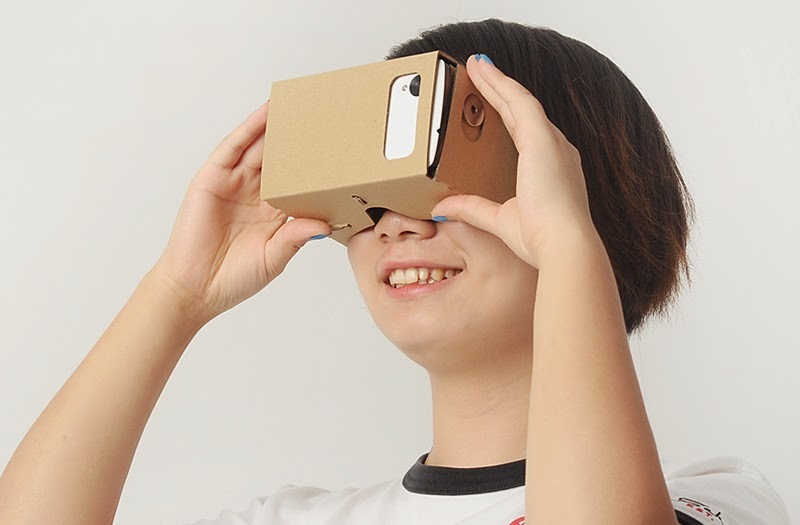 The two ports are selected by using a built-in flip-mirror, with a lever on the back of the telescope. The telescope arrived in a sturdy cardboard double-box about 1200mm long x 300mm x 300mm. It was well packed, and there were no marks or dings on the inner box. Inside the box were the OTA (in a styrofoam box), and two smaller cardboard boxes containing the tripod and other accessories. Unpacking and assembling took just a few minutes. The OTA mounts onto the tripod using a standard camera screw mount - you could mount a dovetail bar (not supplied) onto the OTA if you want, but the camera mount works for my needs. My first impression was that the supplied tripod and Alt-Az mount are rather flimsy for the focal length. In addition to the general problem of vibrations etc, the OTA is supported from the back end, and is quite “nose-heavy” (due to the length of the tube and the heavy front glass corrector), and the tilt-head with twist-handle struggled to stop the OTA from “drooping” whenever you try to point it at a target. However, when I tightened up all the threads on all the bolts and knobs, I found it can hold the telescope reasonably steady, especially if you hang a bit of weight on the hook under the centre-post of the tripod. The supplied mount is "OK" as a lightweight travel mount, but I put the OTA onto an EQ2 mount, and it was much better. 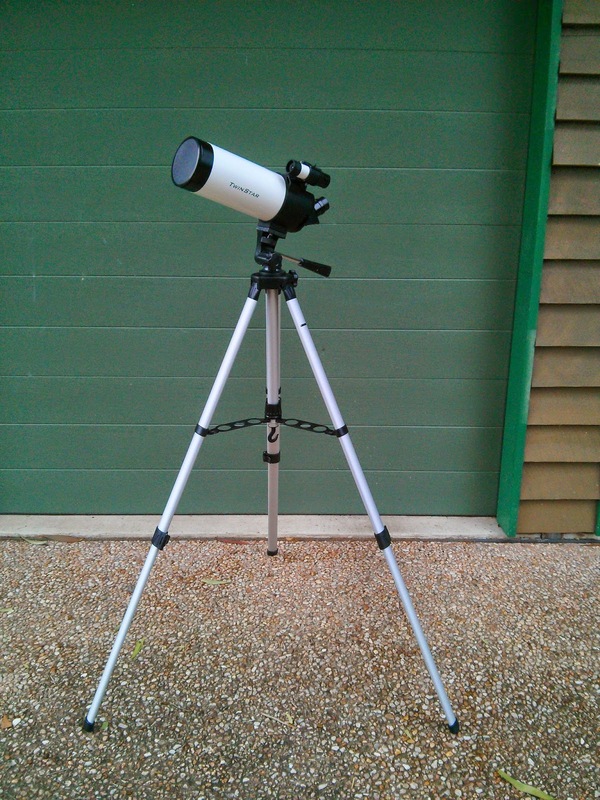 (Having an even shorter tube than my 90mm short-tube refractor, it is even more stable than the refractor on this mount.) I now use the scope mainly on my EQ2 mount (or a Celestron SLT Go-To mount), but I'll keep the supplied Alt-Az as a Grab-and-Go mount, or for terrestrial use of stationary targets (with the supplied 45° erect-image prism on the rear port). First visual impressions were very positive - especially when I switched to some other Plossl eyepieces, rather than the supplied Kellners. Unfortunately, the Moon had already set when I got outside (which would have been a good first test target), but Mars and Saturn were beautifully defined, as well as the Acrux double, Jewel Box Cluster, etc. Using two eyepieces (one in each port, the straight-through port having the 45° prism) means that I can put a relatively wide-angle eyepiece in one, and a higher magnification in the other, and swap between them easily. However, the two optical paths (one with a prism) have very different lengths, so it takes about 3-4 full turns of the focuser knob whenever you swap ports. It’s probably more convenient to just use one port and swap eyepieces in the conventional manner (requiring only fine-tuning of the focus between eyepiece changes), and reserve the other port for a camera or similar. I have found that there is a slight image-shift when you use the built-in flip-mirror, so that the centre of the image shifts slightly to one side as you swap between the two ports. It is quite repeatable, so that when you flip back again, the image is right where you left it - my guess is that the flip-mirror pivot is not perfectly aligned perpendicular to the OTA axis, rather than slop / play of the flip mechanism. You might find your target is slightly out of view if you have a very wide-angle eyepiece in one port, and a very short focal-length eyepiece in the other, but I have no problems flipping between a 25mm and a 10mm, for example. It's not a big deal, but it may mean that the 90° port is not as perfectly collimated as the straight-through port. (Is this why most Maks on the market these days don't have a built-in flip-mirror any more?) It hasn't caused me any real grief, but I mention it in case it is important to a potential buyer. 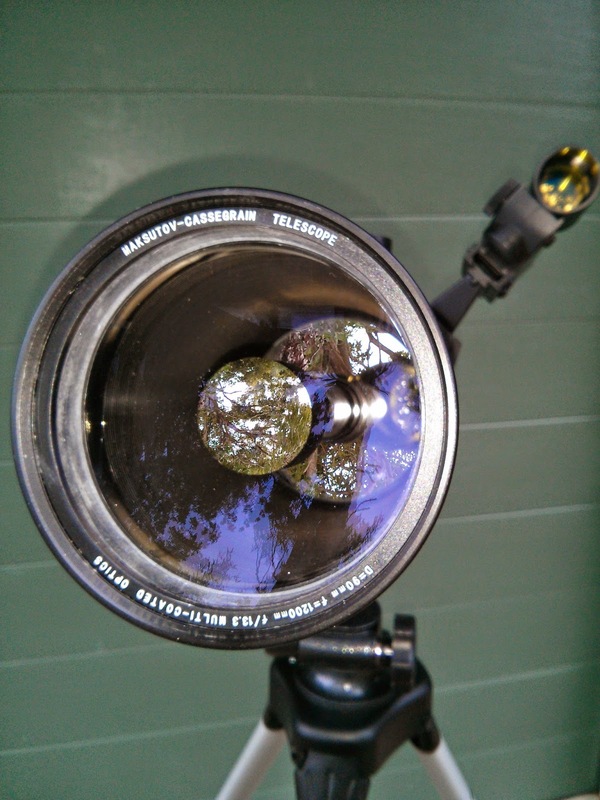 I bought a threaded T-Adapter which allows me to mount my DSLR body onto the straight-through rear port for prime focus terrestrial and astronomical photography. The wider field of view with the DSLR sensor compared to a typical eyepiece means that the image-shift is detectable, but not a problem. I have also bought a threaded "Visual Back" that lets me fit my planetary webcam straight into the back port, without needing to use the supplied 45° prism. The webcam has a much smaller sensor (and field of view) than the DSLR, so the image-shift issue needs to be managed with this set-up. The “focus shift” is a bigger issue, as it makes it hard to use the vertical port as a view-finder and then flip to the rear port for photography - until I tried mounting the eyepiece in a diagonal to increase the length of its light path.to more or less match the DSLR in the rear port. I found that I can focus the camera / webcam accurately, and use a 25 mm or 40 mm Plossl in a diagonal in the top port, and while the eyepiece focus is not perfect, it is quite adequate for view-finding and targeting. Build quality of the OTA - it feels nice and solid, with a good “weighty” feel. The tube and back (including the finder-scope dovetail) are made of some sort of plastic / resin, but it feels very solid and tough, not “plasticky”, and gives a nice solid “metallic” sound when you tap it. The focuser thumb-wheel knob itself feels a bit “plasticky”, but the focusing mechanism and action is very precise and smooth, allowing pin-sharp focusing. Two ports - one for visual, and one for photography. The supplied Kellner eyepieces are OK, but not exactly great. 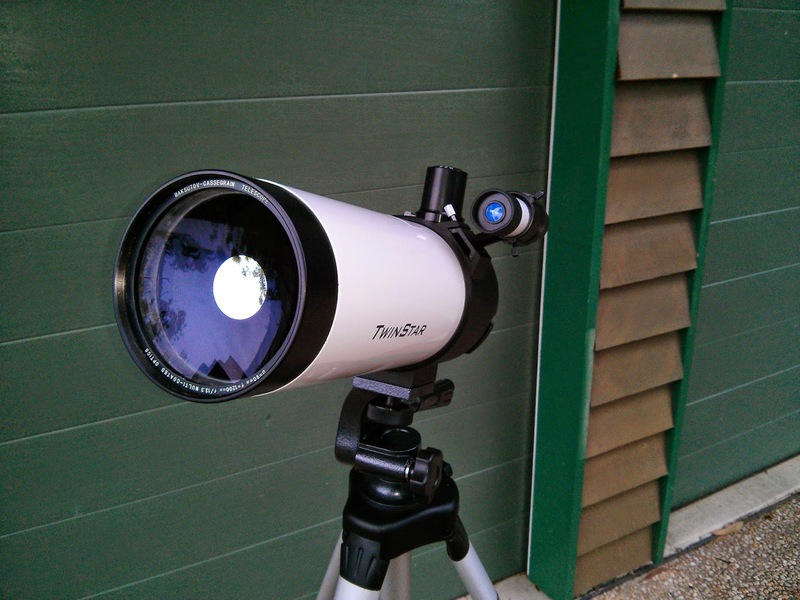 They don’t have any rubber eyecups, so I found I was getting a lot of stray light in my light-polluted backyard. The focal lengths (9mm & 20mm) make a good “starter pair”, and a first-time user would have no reason to complain, but I really enjoyed the view a lot more with my other Plossl eyepieces. The tripod, which is somewhat flimsy for astronomical use. I put the telescope onto an EQ2 mount that I already own, and it was MUCH better! I’ll keep the supplied mount as a compact travel mount for the OTA, but I’ll use the EQ2 at home. If you’re interested in tracking one down for yourself, search eBay for “90mm Cassegrain”, and make sure you set “Item Location” to “Worldwide”, not just “on eBay Australia”. You’ll find several sellers (mostly in the USA) with the same OTA, but some of them sell it on the basic AltAz tripod, and others have it on an iOptron “Cube” GoTo mount. (There are some other OTAs with different brand names, which look suspiciously like they come from the same production line, too.) The sellers are asking different prices and shipping fees - some have a “Buy It Now” price, while others have a “No Reserve Price” auction format - sort them by total price until you find the best deal!